This site created by Barbara Rae Wilson for your enjoyment. Please contact me if you have any problems with any of the links! Thank you. Jane and Del Rae's Sweet Heart Dance have finished their Rally Novice B title April, 2007, they also have their first leg towards a CD (Companion Dog Title) Congratulations Jane. We all knew you could do it. !!! They have also gotten their CGC and TDI. A Baron x Rainy cross from their first litter. Our sympathy to Jane on her loss of Sweetie at 9 to cancer. Pictured is Dexter, he had been a ten yr. old's puppy that went through Beginner I and II of obedience and a year of 4-H before the excitement of having a dog and all the responsibilities took their toll. Left on a chain outside the barn, I reclaimed him. Thanks to Tricia for adopting him and all her work, he has completed his HT. Dexter also has his CD, CGC and TDI. Tricia took Dexter to the 2004 USASA Natls. and picked up some agility legs with a first place on Saturday, and completed his agility title later in the year. Sadly, Dexter came back to me again due to life changes. Karen Obermyer and her family near Toledo have now adopted Dexter and say they will never part with him. Congradulations to Carol and Taylor for taking a second place at the Burton Puppy Match. It was the first time Carol was ever in the ring but we have her hooked now! Next she wants to try herding! Also, to Del Rae's Peaches N Cream (Peaches) not pictured here, for taking a first place, Breed, and then a Group 2, at the Puppy Match. This is Del Rae's Prima Dawna "Dawn" has just completed her CD with three First places! She also has her CGC. This is the first dog that Carol Meyers has shown and we are very happy for her and Dawn to have such success in only four shows this year. What a way to go Carol!!!! No reproduction of any of the photos on this site without written permission of the owner. Thank you! . Chase, a Swayze x Betty puppy born June, 2005. 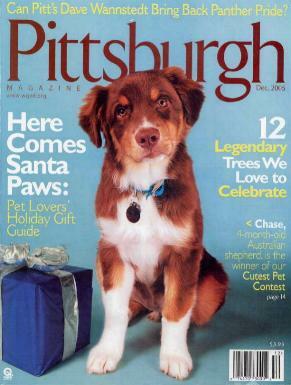 He is going to be a "cover puppy" for a Pittsburgh Magazine issue coming out in January 2006. What a Cutie! That's the cover at the top of this page. Things did not work out for his first family and I want to Thank them for returning him to me to find him another home. This is "Rocky" owned by Fred Estlack, of Cortland, Ohio. Rocky has just gotten his HCT. Rock is a Baron x Rainy son. He is a full brother to Dexter above from a repeat breeding. He is a litter mate to Niiki Rae pictured later, below. This is "Tex" who actually lives in Texas. A Baron x Betty son. He is the Companion to Rhonda's family and the 4-H project for their daughter. He is a litter mate to Jazz and to Cayenne pictured above. Jazz now has her AKC CD, RAE, MX, MXJ, XF. To learn more about Kelly click here! Read more about Chase below!!! This is Cody, a Baron x Tellie puppy born June, 2005. What a Cutie! How about that Halloween costume! He is owned by Steve Guido and family from Michigan. He has just finished his obedience class and has started agility. This is Willow, a Monty x Rainy puppy born March, 2005. Isn't she stunning with her antlers? She and her family, Sharon, Joe, Rose and Lily are just learning about all the fun they can have with an Aussie. She has just finished her obedience class and has started agility & Rally, and is working on a drill team. Our hats off to Petsmart for their great fund raiser. Pictures with Santa proceeds go to the local Animal Shelters. She is a sister to Doc below. This is Niiki Rae at 3 months and then on her Ist birthday! She is loved and spoiled by Pat of Newton Falls, Ohio. She is a Baron x Rainy daughter and is a litter mate to Rocky above. This is Cayenne, owned by Steve and Jen from Kent, Ohio. He had started out as "Gunner" and was going to be a Jr. Handling dog but the young girl decided she didn't want him and brought him back to me. He then went to another home and was trained in obedience and was doing well. However life had another turn in it as his new family both lost their jobs when the copmpany they worked for closed. Again he came back to me. Steve and Jen knew he had had some bad luck and were going to make him theirs. They have given him a wonderful home. How wonderful....Jen and Steve have adopted Betty, Cayenne's mother. What better life could I wish for Betty. You can see from the pictures ...she is enjoying her new family!! This is "Mills" and he is a litter mate to Chase above. A Betty x Swayze son owned and loved by Jessica Conant of Indianapolis, Indiana. He has just completed his obedience class and Jessica has just graduated from College. They are looking for a house with a big yard by the Doggie Park and Mills will go back to more classes in the fall. I think they are going to try agility! This is Jessie, a Baron x Angel son, and Josie doing agility in Cheswick, PA. , May, 2005. 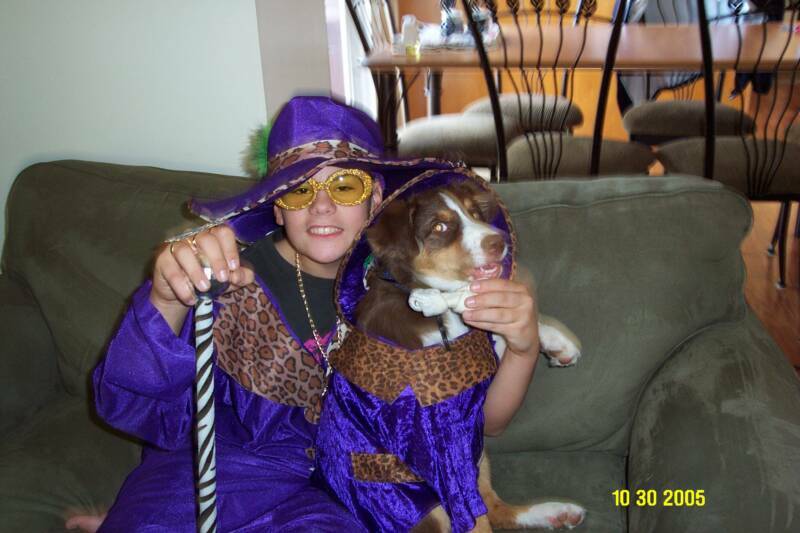 He is owned and loved by Josie Hail from Austintown, Ohio. He is offically Del Rae's Main Attraction CD, NA, NAJ, OAJ. They have just added Rally !!! Congrats and continued Good Luck! (a.k.a. Del Rae's Root N Toot N Cowboy) they have completed their RN, and their Excellent Agility titles. Rowdy is a Sam x Rainy son and a litter mate to Dawn. Dexter and his new owner have completed their JHD Congrats to Karen and Dexter! April 2006 Dexter now has an ASCA herding started leg! Dexter and his buddy Hanna for life!!! This is Adam Maul from Florida with (his BB x Ms Bea daughter) Nala and Atti, his Australian shepherd Samoyed mix. Adam has sent several pictures of them hiking and rollar blading around Florida. Please click here for more pictures. If you are still having snow in April, you need to see these pictures! She is hoping to compete in Agility and Rally soon. He has a new family to love him. They have renamed him "Morgan" and he now lives the country life. His new owners are horse trainers so he has gone from the big city life of Pittsburgh to the Arabian show circuit. And he has a new play mate...as you can see 2 red heads! They are looking for Easter Eggs. This is Cloey and Bently, 2 pups from Betty's last litter sired bt Del Rae's Taylor Made (a Baron son x Betty a Baron grandaughter) They reside in the Cleveland area with their owners Jeff and Erika. They don't have sheep in their back yard but I understand they get to see a lot of deer!!!! Our sympathy to Karen and her family on the loss of such a devoted friend and companion. Dexter was 10 years old. Gary, Robin and their daughter have decided to add to the family with Baron's daughter "Keeper" in 2011. Watch for them at an Agility Trial one of these days. Erin is so busy with school band, riding horses, Gary and Robin are starting to take over the dog activities......sound familiar?